Lately, Jessalyn has been a tooth loss machine. I suppose this is typical for an almost 8 year old...but it seems that every time we turn around she is working on another one. After waking up to find tooth number 7 replaced with some cash, Jessalyn came into my room demanding that she know the truth about the tooth fairy. I hesitated for only a moment..being sure that she really wanted to know (having a good feeling that she knew already)...and then proceeded to tell her that I was the tooth fairy (or sometimes Daddy...or even Shara when I didn't happen to have any cash on me)...and she was quite satisfied with my answer. It didn't bother her a bit to know that the tooth fairy wasn't really real. This past Friday Jessalyn had a very loose tooth, just barely hanging on. She was very concerned because every time she smiled it would stick out and she would have to stick it back into a normal position. This was particularly bothersome to her this day because she had to perform with One Voice that weekend and she really really wanted the tooth out before that. I am not terribly fond of pulling teeth. It gives me the heeby-jeebies...but I was willing to help her this time (maybe because I didn't want her to be a snaggle tooth during One Voice either). 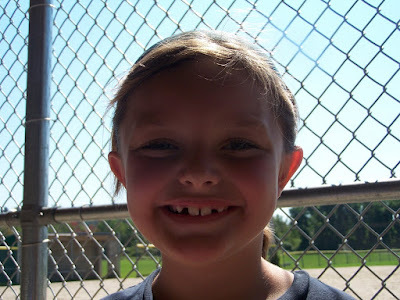 I went ahead and pulled her tooth out for her. Later on that day while we were folding laundry I was asking her what we were going to do about the tooth..since she knew that I was the tooth fairy. I asked if she was going to expect me to fork over a dollar bill. "No. Since you pulled it, you only need to give me 50 cents." She's a thinker? Don't you mean a stinker?! What a business women she is!! !